I believe I’m becoming a hermit. Partly by choice, and partly by circumstance. And I’m not totally happy with this development. I haven’t really felt like doing much, lately. Well, that’s not entirely true. I haven’t felt like planning much lately. Although I’ve had a lot of training and experience in doing things like event planning, and coordinating logistics (and, honestly, I enjoy doing it for work)…sometimes I just don’t feel like being the one in charge of determining where everyone is going to go, and what to do when they get there. This past weekend was Halloween, which is one of my favorite holidays – costumes, spooky stories, hot apple cider, crunchy autumn leaves…what’s not to like? (And candy, of course, though that’s less a draw for me and more one for Robert and my brother) Back in my 20s, primarily when I was working at the theater, Halloween meant a big party held at one of our houses – with tons of snacks, games, an informal costume contest, and usually a movie at the end, where everyone would fall asleep on the couch, in armchairs, or just on the floor, still dressed in costume. That’s not really my type of Halloween, anymore, for a number of reasons. But that doesn’t mean I don’t like to mark it somehow. So, this year, I decided I needed to get out of the house and do something. 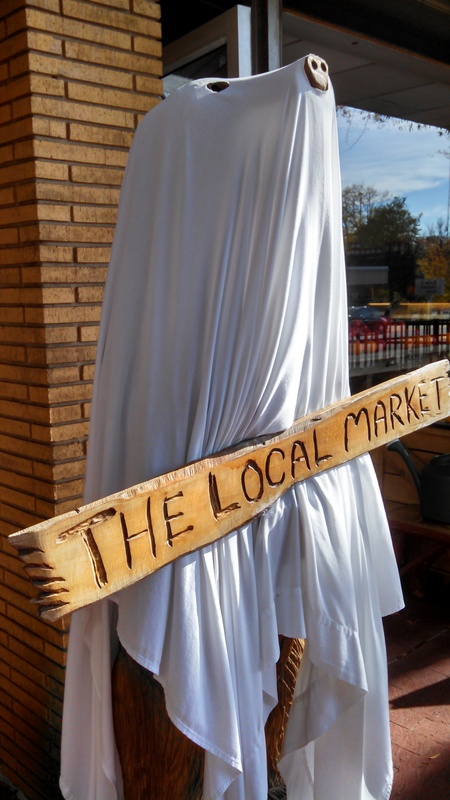 My Saturday morning started with a nice visit to the Falls Church Farmer’s Market, which I hadn’t been to in quite some time. The wool vendors were back again (though I was informed this is the last season they’ll be doing farmers markets), I picked up some sausage from the sausage guy (seriously, everyone just refers to him as the Sausage Guy), and bought the world’s biggest turnip for $1. I wandered around Falls Church a bit, admiring the leaf-strewn sidewalks, got some bubble tea at Kung Fu Tea (at the same time that a robbery was going down at the bank in the same shopping center), and then headed home for a whirlwind of Halloween prep. First step…pumpkins! up, but there were two more pumpkins awaiting a face or a creepy graveyard. Robert gave me leave to carve up his, since he had to work that day, and I swiftly cleaned them out and readied them for the jack-o-lantern treatment. I remembered to wear long rubber gloves while scooping them out this time. My skin reacts poorly to raw pumpkin guts. I knew that I wanted a raven on my pumpkin, but I was a little lost when it came to Robert’s second one. I had three options to choose from, and I liked each one. 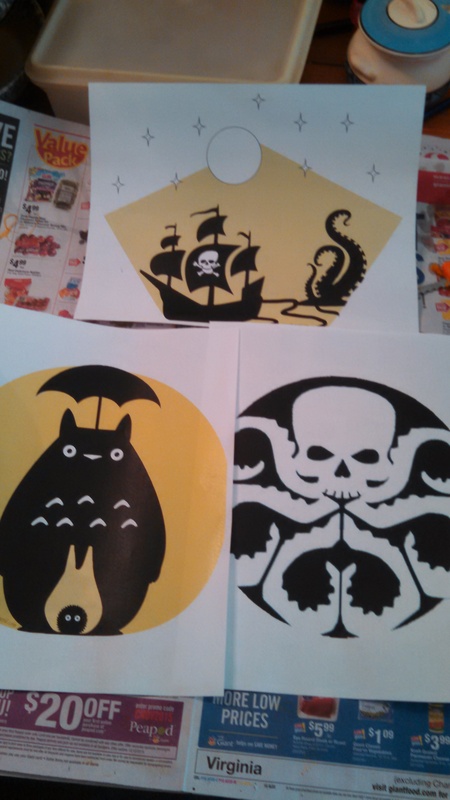 I ultimately decided on the Totoro one (which also appears to have a Calcifer in it), knowing his love for Miyazaki. For the evening’s entertainment, we decided on the corn maze and hayride at Cox Farms. I wanted to go in costume, but I knew I wanted something easy to move in, cute, and warm. 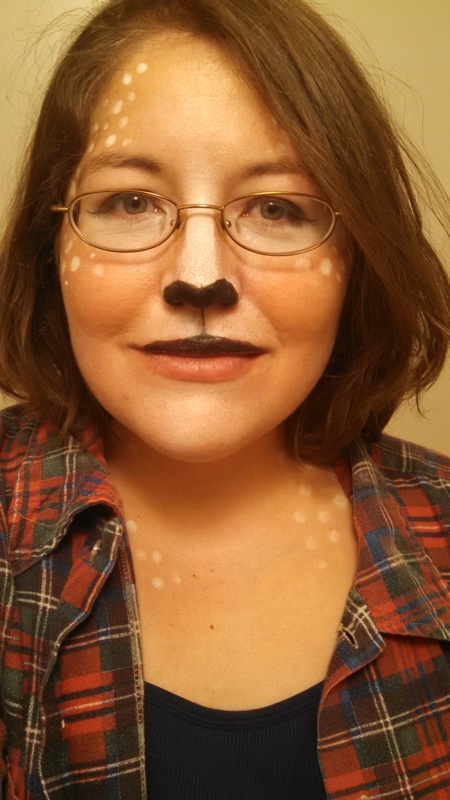 I had done faun makeup for work on Friday, and I was happy with the way it turned out (I even went over to the Ecosystem Farm to liberate some produce, much like a real deer). I decided to add a little more to the look. I rummaged around the house and found a red plaid flannel shirt and one of Dad’s old birding vests. Robert agreed to dress up as long as I handled the costume and it wasn’t something too crazy. I recycled an idea from DragonCon a few years ago – Schroedinger’s Cat. I still had my old wanted poster, I grabbed an old boy scout bandanna, and found an old trench coat that sort of looked like an old drover’s coat. Unfortunately, my ears were nowhere to be found, so I had to make some new ones. Thankfully, I had little bit of black fuzzy fabric left over from making my Kung Fu Panda costume several years ago. I cut two squares for the ears, and a long rectangle for the tail. I wanted to add a little extra color. I thought I still had some white fun fur somewhere, but a quick search of my fabric bins turned up nothing. I happened to step back to the store room, to see if it had been moved back there, and spotted my old Wise Man head, which happens to have a few pieces of the aforementioned white fun fur incorporated into it. I took a pair of scissors and snipped off a few corners – nothing that would ruin the look of the head, but that I could still use for the cat ears and tail. some fiberfill I had on hand, made a belt loop out of felt, and stitched the thing closed. The ears are little more involved. I made two triangles out of some floral wire, bent them a little, and then added another little “leg” running up the back of each ear, so they’d be stable and keep their shape. Then I whipstitched the black fabric around it, tucking the raw edges into the middle of each ear, and followed up with a small scrap of white fun fur on top. The great thing about working with that fabric was that I didn’t have to worry about keeping my stitches nice and neat. You wouldn’t be able to see them anyway! I sewed a large bird clip (I don’t know the technical term for them) to the bottom of each ear, securing them with a bit of hot glue, so they wouldn’t slip out. We ended up needing to add a smaller bird clip to each ear, later in the evening, to keep them attached. When I finished Robert’s ears and tail, I decided I should probably add some ears to my costume, as well. I had some tan and light pink felt on hand and set about creating not-so-little faun ears. Each one got another bird clip, to affix them in my hair. Originally, I was hoping to just clip them into one of my crocheted caps, but the only one I could find didn’t really fit with the rest of my look. Instead, I tied back my hair (it’s gotten long enough to actually hold it back in a ponytail! Eek!) and clipped them in. 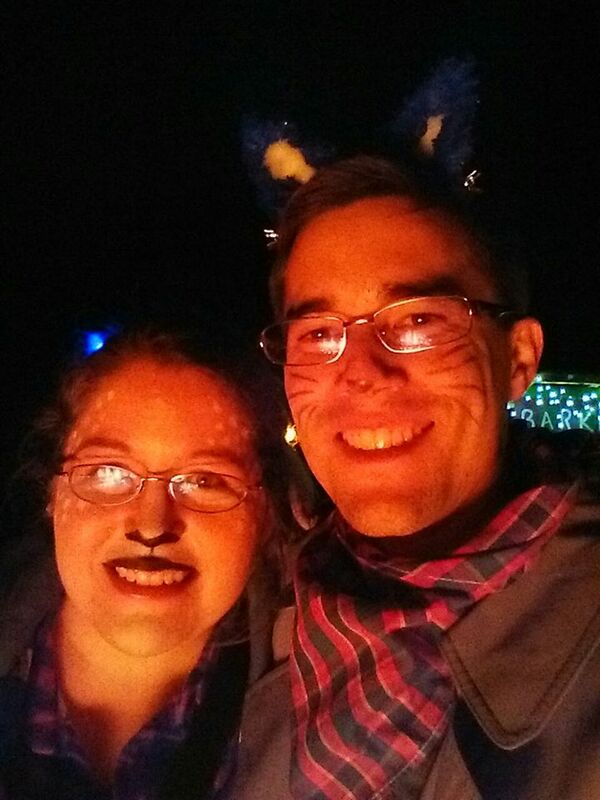 Our costumes assembled, and our pumpkins lit, it was time to head off to the farm. There were just four of us this go around. The place was pretty crowded (it was Halloween, after all), but it didn’t seem too bad. There was no wait for the maze, and the line for the hayride moved pretty quickly. I was quite impressed with the hayride this year. The farm created a cohesive storyline this year – the Zombie Zoo – and I liked how they included sound and video. The corn maze was a little crowded this year, which I think affects the success of each scare. If you’ve got people right up on your tail, someone is going to miss out on the full effect of the creepy teddy bear jumping out at you with a chainsaw (yes, that was an actual thing). Half of our small group had also purchased a ticket for the Dark Forest – from what I can tell, a wooded version of the corn maze experience. Robert and I vowed to check that one out next year. While David and his friend wandered through creepy woods, we went to the game area. Robert participated in the Nyctophobia maze – a pitch black maze – and we both shot some pumpkins with giant slingshots. I managed to hit one of the targets, so I got an extra shot. All in all, not a bad evening out at the farm. When we got back to the house, we found that we’d actually had trick-or-treaters this year. I had joked earlier in the evening that this would, of course, be the year we get some knocking at our door and I wouldn’t be there to see them. And it was true. We had nine. NINE! That’s more than we’ve had the past three years, combined!